Ross McDonald took part in the Silver Lining Wing Walking. 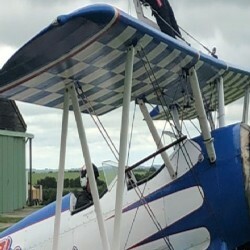 Everyone Met at RAF Rendcomb, Gloucestershire on 20 June to meet the pilot and assistants to give the wing walkers their safety briefing before going up on the plane. Everyone flying was presented with fabulous jumpsuits. People brought picnics and there was a great atmosphere in spite of the slightly cloudy and wintery weather. On the first flights the altitude was kept low to get people used to the experience, many hilarious poses were actioned in the air. Top Gun music lofted through the air as people walked to and from the plane and much support was given for the brave. There were a few brave souls who ventured back into the air for some aerial-acrobatics including Loop-the-loops and barrel rolls.